At its annual Interact conference today, IAB Europe announced that digital advertising grew 13.2% in 2017 to €48bn, driven by strong growth in social, mobile and video investment. 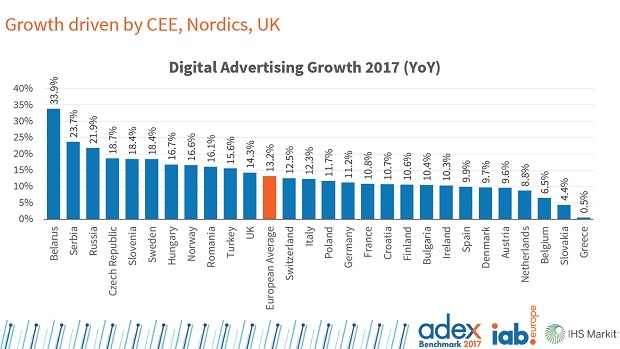 The AdEx Benchmark study is the definitive guide to the state of the European digital advertising market and is now in its twelfth year. A total of twenty markets grew double-digit. Mobile dominated with double-digit growth in all 27 markets in the study. Mobile display grew by more than 40% and now accounts for 42% of total display advertising whilst video now accounts for more than a quarter of total display. Social grew at a similar rate at 38% and increased its share of display whilst video grew by 4x the rate of non-video display at 35%. The growth in video is driven by out-stream advertising which experienced a 73.4% growth compared with in-stream at 6.9%. The IAB Europe AdEx Benchmark study divides the digital ad market into three categories: Display, Search and Classifieds and Directories. Growth in these advertising formats has been underpinned by shifting uses in devices and changing consumption patterns. Display advertising outperformed search and classifieds with a growth rate of 14.9% to a value of €19.3bn. Search is still the largest online advertising category in terms of revenue with a growth of 14.4% and a market value of €21.9bn. There was also strong growth in the most mature markets (in line with or above the European average) such as the UK (14.3%), Norway (16.6%), Sweden (18.4%), Switzerland (12.5%) and Denmark (9.7%) demonstrating that maturity doesn’t hinder opportunity for further innovation and growth.